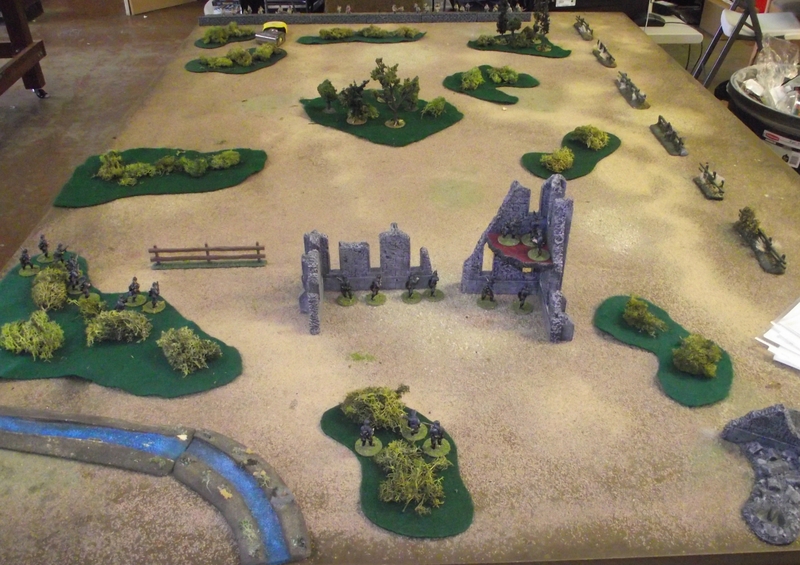 Saturday the local HMGS-South group played a Napoleonic game using a modified version of the Empire V rules. The game pitted two corps (four divisions) of French against a similar force of Austrians. The Austrian division on the left flank advances. The Austrian center right in the foreground. The Austrian right flank division is ordered toward a small woods. The French division opposite occupies that woods and most of the raised ground on this end of the battlefield. The French center left division advances to meet the oncoming Austrians. Infantry firefights break out along the length of the front. The Austrian right flank division pivots to face the advancing French. Austrian infantry advances on French guns in the center. An Austrian division leaves the field. French units advance into the void and move to overwhelm the Austrian right flank division. The French success on their left seemed more significant than their losses on their right, but overall a closely fought battle. Saturday the local HMGS-South group played a Napoleonic game at the Dogs of War shop using a modified version of the Empire V rules. The scenario was based on the attack of d’Erlon’s corps at Waterloo. 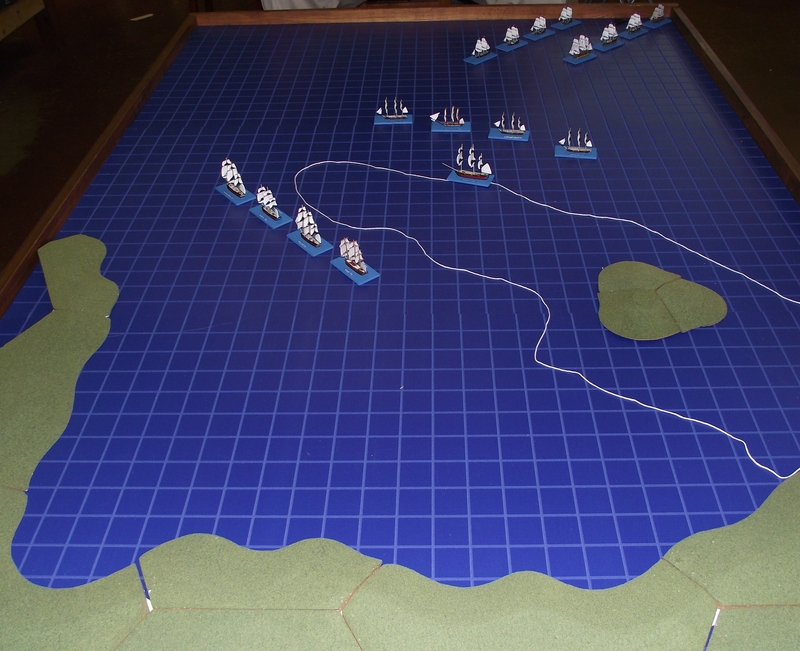 Although on the table in this shot, the French on the left will enter on the first turn, after a bombardment by off-table artillery. The French grand battery (off-table) has destroyed more than half of the deployed British artillery and damaged Bijlandt’s infantry. French infantry break through the British line behind the crest. La Haie Sainte and the sandpit are under fire. Bijlandt has lost 2 of 5 battalions. Bijlandt is gone, and French cavalry has arrived. When we quit due to the late hour, there was a significant hole in the British line. Lots of uncommitted cavalry on both sides were poised to clash there. Saturday the local HMGS-South group played a Napoleonic game at the Dogs of War shop using a modified version of the Empire V rules. The game was a introduction to the rules, so no specific historical battle was represented. 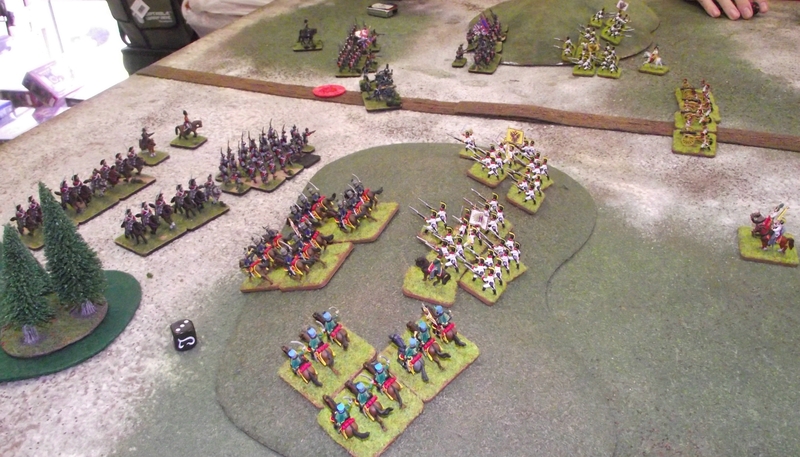 Each player had a division of infantry, cavalry and artillery. 15mm figures from a variety of manufacturers. Prussians and Russians (foreground) face Poles and other French allies. The Austrians advance in a compact mass in the center. French cavalry quickly destroy the British and Austrian cavalry, then turn to face the exposed Allied infantry. Prussian cavalry attempt a wide flanking move. French cavalry hit an Austrian column in the flank and destroy it. They are then seen off by British infantry fire. 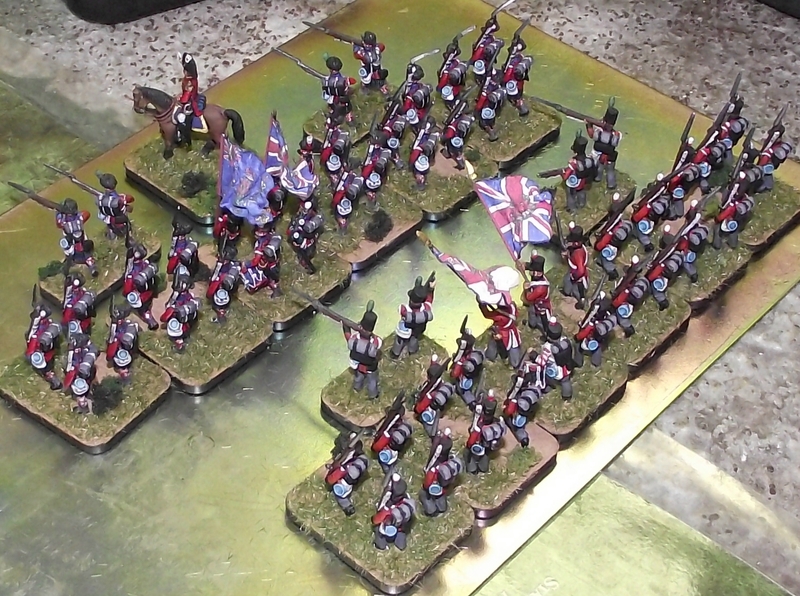 This weekend the local HMGS-South group played a Napoleonic game using Column, Line and Square, Version 2. The scenario was an Allied attack on the French near Probstheyda, south of Leipzig, on 18 October 1813. The French are on the left (north). On the right, from top to bottom, are the Prussians, Russians and Austrians. The French right (western) flank with the Austrians in the distance. The French left deployed on rising ground. The Emperor and his band. Additional troops arrive on both sides. The cavalry clash in the center. Austrian lights wipe out the crew of a French battery. More cavalry clash in the center. The assault on the French left. After 4 turns, and the end of the game. The Allied objective was to take both villages. The French objective was to drive the Allies from the field. When the game was ended due to time, neither side had achieved their objectives. 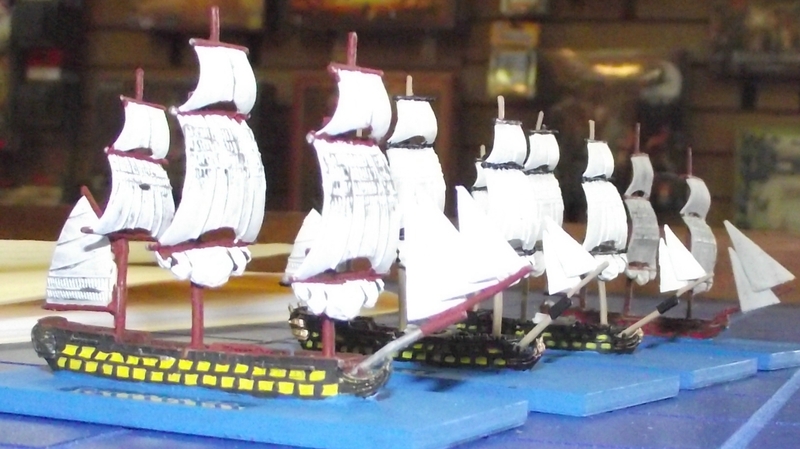 Saturday the local HMGS-South group played a Napoleonic naval game at the Dogs of War shop using Ship of the Line rules and 1/1200 scale miniatures. A French squadron of one 120, one 80 and five 74s with average crews met a British squadron of six 74s with two elite and four crack crews. The fleets converge on a broad reach. The wind is from the left in this photo. Long range fire damages the French 120 leading the near line on the left. This reduces her movement to the extent that she will not get into the battle. The French maneuver while the British keep to line ahead, shooting as they pass each target. Two French 74s break the British line. The windward French 74s (right) put on full sail to catch up. A French 80 strikes and her 74 consort is pounded in the upper right. A British 74 in the center takes heavy damage from two 74s. The windward French 74s get into the fight. Time brought and end to the game at this point. 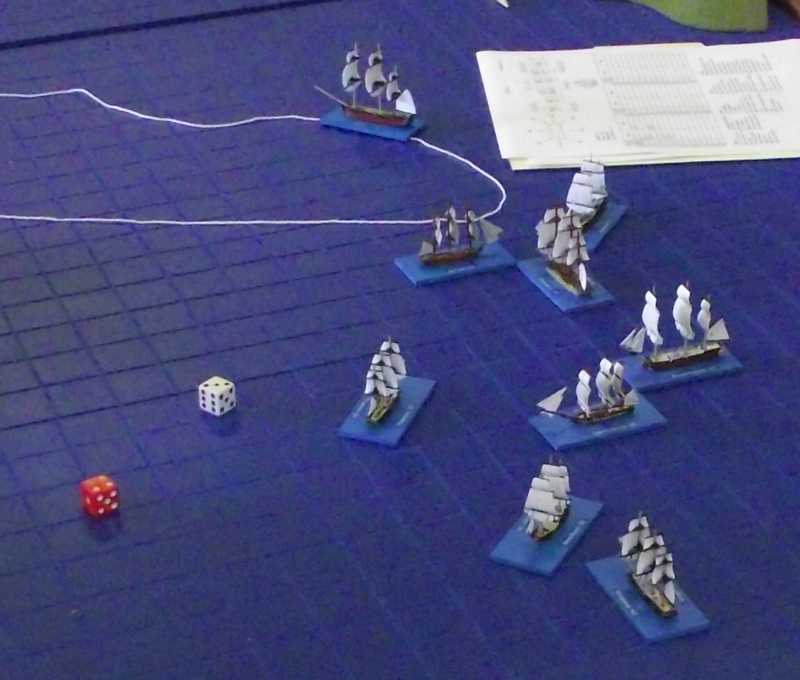 On Saturday the local HMGS-South group played a Napoleonic naval game using Ship ‘o the Line rules (by Battleline) and 1/1200 scale miniatures. Nine French and Spanish ships defended the grounded French 1st rate Orient from an approaching British squadron of six ships. The grounded Orient, with French and Spanish in the background. The allied ships split up to double the head of the British line. The Temeraire, leading the British line, comes about. 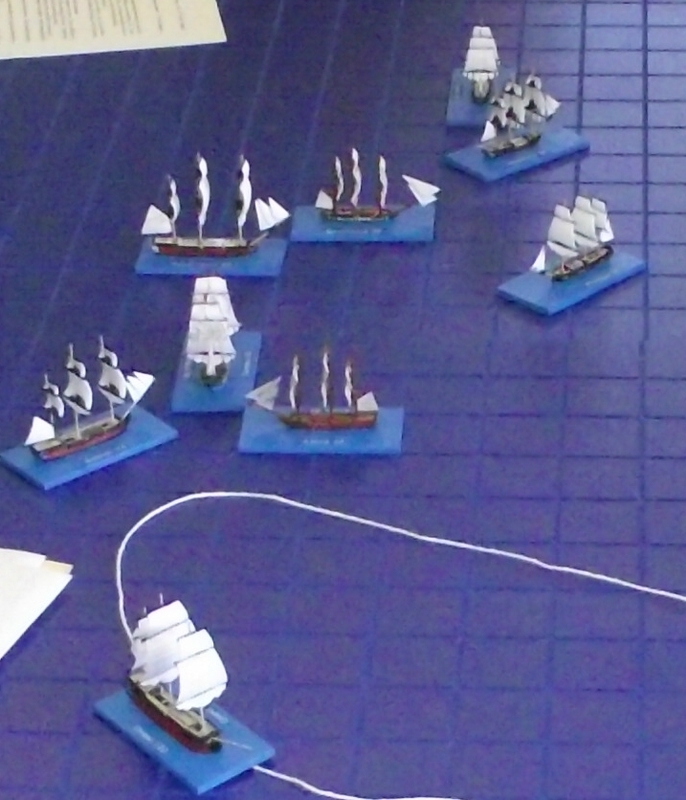 As the Temeraire engages several allied ships, the two following British 74s weave through the Spanish ships. Red dots have been added to indicate British ships. The Temeraire is surrounded by six allied ships. HMS Conqueror is captured by the crew from the badly damaged French 74 Pluton, but is recaptured. TheTemeraire is lost. 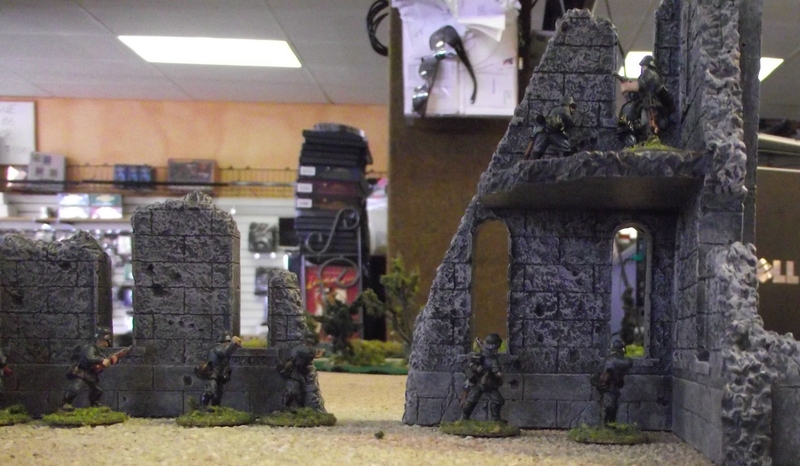 Today the local HMGS-South group played three games at our regular monthly meet. Game 1: Napoleonic (or should that be Nelsonian?) 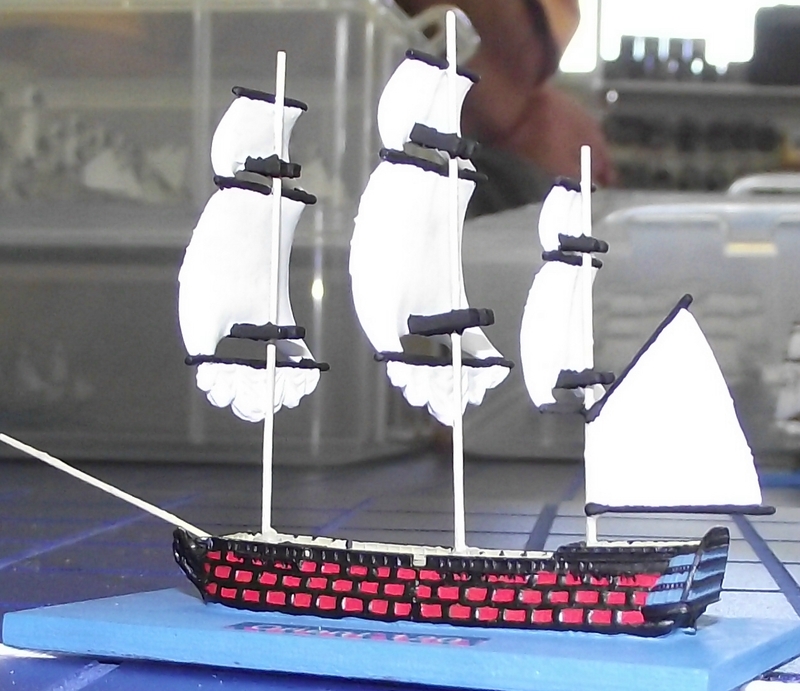 naval using Ship of the Line rules and 1/1200 scale miniatures. An Allied 3-decker is aground and must be protected from a British force of ships-of-the-line and frigates. Game 2: Napoleon at War rules with 15mm figures. A battle of the little known Anglo-Austrian Unpleasantness of 1805. 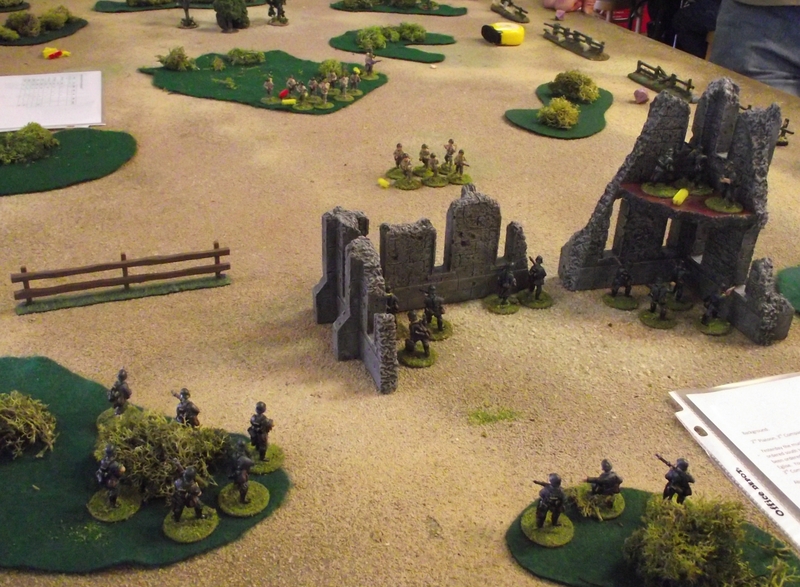 Game 3: World War II skirmish using ‘Disposable Heroes & Coffin for Seven Brothers’ rules by Iron Ivan and 25mm figures. Three US paratroop squads (each of a rifle section and a BAR section) must eject two German squads (each of a rifle section and a LMG section) from the stone buildings. The action is near Turqueville, June 7, 1944. The field from the German side. The Americans start at the stone wall at the far end and must take the stone ruins in 10 turns. LMG on the upper floor and riflemen below. Initial positions with the British entering from the upper right. The white line indicates shallow water. The Allied fleet defending the grounded ship. The British in the Nelsonian two parallel lines-ahead. At the end, the Americans still had plenty of time, but not enough men. Don’t ask me what happened. I was busy in another game.